It’s now or never, Great Whatsiters. Let’s make history today! I’m sure I don’t even have to say this, but please, please, please vote. Even if you aren’t feeling well. Even if the lines stretch around the block. Even if you have a crazy deadline at work. And especially if you are a California voter who plans to vote no on Prop 8! Let’s do this thing! RB and I will be at the polls from 6:30 a.m. – 8:30 p.m. today, waving No on 8 placards at people. But I look forward to checking in when it’s all over, so we can have a virtual toast together, dear friends. I’ve never been so excited, and so scared, about an election in my life. 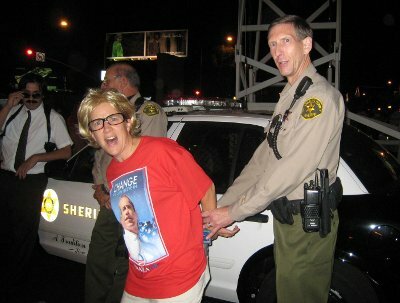 So, just to lighten the mood, here’s the Crazy McCain Rally Lady getting arrested for wearing an Obama shirt. Yes, it was Halloween — but that is a real cop! Making a fake arrest, okay, I admit it. I love West Hollywood. yesssssssssssssssssssss! i just came home from voting. i was number 3 to vote at my poll. the two people in front of me were tiny little old indonesian ladies. don’t miss this excellent article in today’s new york times. it really breaks things down well. i wish you could all be at our house tonight for our election party and argue over who gets to use the blue marker on our electoral map. lines around the block at the polling place here. adriana and i will raise a glass to y’all as we go to southpaw’s obama extravaganza tonight. Results are in from Sylvia’s school’s mock election: Obama 378, McCain 11, Both 4.
shake well. serve on the baracks. I got Swells out of bed at 7AM for this — no small feat. We are on our way to a neighbor’s garage to make history. I’m so effing excited! I wish we could all be together at Trixie’s house. i thought this story was thrilling. hope it wasn’t like that in your neighbor’s garage. swells was out of bed at 7 am? maybe a new era IS beginning! There’s nowhere I’d rather be tonight than in Philly with yall. Nowhere! There’s nowhere I’d less rather be than in my classroom tonight, which is where I will be instead. Nowhere! I am so sad I won’t be there. makes me want to go back to bed . . . but I’m too excited, cause I just voted!! awwwww shucks, swells, that’s real nice. and awwwww nuts, swells, that you have to be at stupid work!! J-Man and I were in line at our polling place by 8:15 or so this morning (no small feat for us) and waited a little over an hour. I’ve never, never, never waited longer than 5 or 10 minutes to vote. I didn’t care a bit; it was amazing to see such a great turnout. P.S. To #8 and #9: get a room. just to clarify: “Oh, peaches!” is an expression of hilbilly frustration “like “Awwww, nuts!”)–not the lovey dovey nickname it sounds like it is. not that i don’t feel that way. 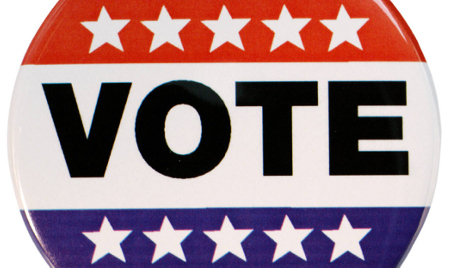 Y’all should check out this Electoral Vote Calculator and post your predictions…. I’ve got Obama at 338, McCain at 200. That’s my conservative prediction. My more hopeful prediction is Obama 538, McCain 0. Obama at 475. Bigger than Clinton. In fact, he surprises the pundits and grabs Bill’s arkansas. How about a wager on the time of Obama’s acceptance speech? I’m guessing 12:13 EST. Grabbing a hit named bill’s Arkansas? All’s I’m saying is, he could get jailed for that in seventeen states. Hopefully not California as of tonight! Do any of you Californians have info about Prop 8? What’s happening with it? Indeed. OTOH the NY Times is telling me Prop 8 passed. A great good, I guess it had to come tinged with bad. Not clear yet whether it passed. Exit polls show is winning. Actual results with 15 percent of precincts reporting show is losing. Too early to say..
Not clear yet whether it passed. Exit polls show it is winning. Actual results with 15 percent of precincts reporting show it is losing. Too early to say.. Sorry, that was confusing. Exit polls show WE are winning. However, the actual results, now with about 30 percent of precincts reporting, show we are losing. And of course, the actual results are the only ones that matter.